My name is Simba. 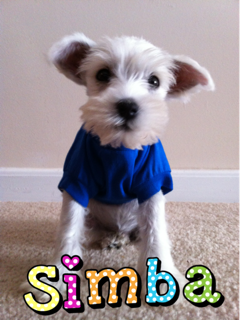 I am a white Miniature Schnauzer. I am the king of my family. RAWR! 🙂 My birthday is March 21, 2012. I moved in with my new family in May 2012 and they are madly in love with me. I mean look at me…how could you not fall in love with me at first sight? My mom (Kia) named me Simba because she always wanted to name her pet this when she found the perfect one…and here I am. The Lion King is one of her favorite child-hood movies. I think Simba fits me quite well, don’t you? This blog will be all about me! Okay, okay, not ALL about me. Other dogs may make appearances and my family will on here quite often, but I’m the star of the show! This is a dog blog about life with a Miniature Schnauzer. I’m the inFURmant because through my mom’s love for me, we are providing you with information about me as well as dog information such as dog fashion, dog tips, dog fun, dog product reviews, giveaways and more! You will also find stories about my family like my mom’s pregnancy journey for example! So this blog will contain dog topics as well as human mommy topics.